Triggered by this question: How to mass delete Tridion MessageCenter warnings? I have been moved to issue the Tridion Bookmarklet challenge. As this is a community challenge, we'll be making use of this question to do the voting. Create a useful and well-constructed bookmarklet which enhances the Tridion GUI in some way. It should work with SDL Tridion 2013, but you may wish to consider making it work for 2011 as well. Publicise it. You should tweet a link to your entry using #tridionlet. You also need to link to it in an answer to this question. Use whatever other means are at your disposal to publicise your entry. Get this all done by the end of 31 December 2014. What happens once you've done this? The judging will be done by the community. This is the reason why you need to link to your entry from an answer to this question. We'll wait until the end of January, which should give people a chance to finish their New Year celebrations, and actually read the code... maybe try the bookmarklets out in real life. There'll be a burst of publicity during January to make sure people think about voting, and then whoever has the most votes by the end of 31 January 2015 will be the winner. Is it better to wait until January to vote? Yes - the entries might be improved right up to the deadline. Who knows? Also - some people may prefer not to put their entry on-line until quite late on, or may feel pressured by seeing other entries getting more votes (or less). Entrants: remember that many people will wait until January to vote, so don't read too much into it until then. Voters: I'm putting you on your honour to vote for the best entries. So please don't just vote for your mates, and please don't vote to show some kind of company loyalty. This is personal, not corporate. It's Pub Up. All it does is keep you in the same folder that you're currently in, but take you one publication higher. My bookmarklet doesn't require updating; it calls JS from a server and executes it. So if you find bugs, I'll be able to resolve them for everyone, simultaneously. Thanks Dom for raising the bar through this challenge and given everyone an opportunity to unleash the power of Anguilla Framework. My submission for this challenge is a Chrome Extension that removes the messages / notifications from the SDL Tridion 2013 SP1 GUI. It works on the Active Tab in Chrome that has /SDL/ in the URL it wont work when your in the component TAB. Since it's for public use, i needed to check on SDL in the url so it won't interfere with any other open TAB. Thanks to UI Beardcore for the basic code. I try to bend the rules of the challenge ;-) and add this handy tool. This bookmarklet helps you to quickly logon to the SDL documentation portal. See the raw code in Gist, just add this in the location field of a new bookmarklet. 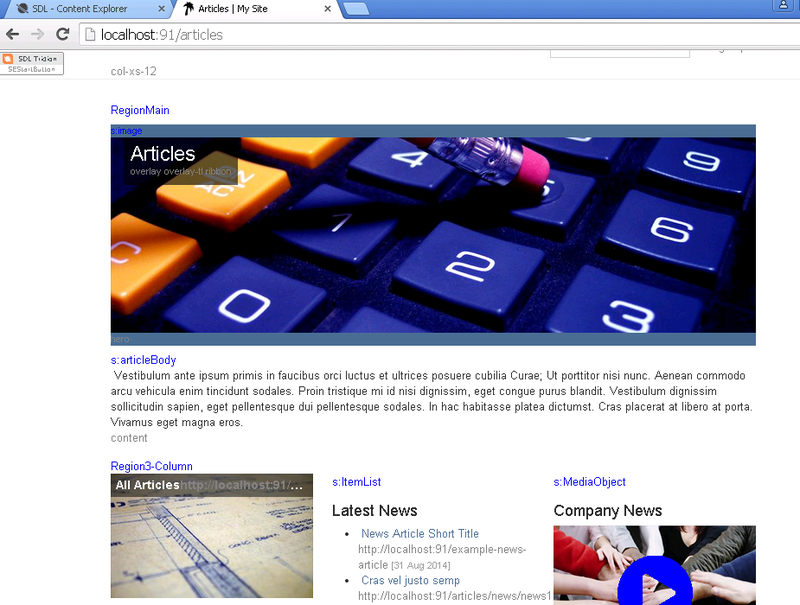 Gist, the full source and blog post are available. Special thanks to UI Beardcore for the help in cleanly acquiring a reference to the Dashboard view. I'd like to throw my hat into the ring with a Get Creation Info Tridion bookmarklet. It simply displays the creation date and creating user of a selected item in the main working area. As well as the Anguilla Snippets on the Tridion Practice site. Disclaimer: This code is not production quality, and has had only limited testing. A second submission. Not nearly as exciting as the first. What it does is look at your active frame (whether you're navigating, or you have a specific item open), and it makes that item available on the window object as a anguillaMediator. Essentially, it acts as a mediator, or a shortcut, for doing stuff with Anguilla. It could be very useful for building more complex bookmarklets. This one opens the schema (in a new tab) of the Component you have currently selected. I often want to check the fields etc of a component, and this is a quick way to open it up. The bookmarklet works out the owning publication of the schema in question, and opens it in a new tab. My 2nd entry into the Bookmarklet Challenge. Using some CSS that Frank Taylor posted awhile back along with Paul Irish's CSS injecting bookmarklet, you can "auto-document" elements in reference-implementation pages. Use the browser Console or the bookmarklet to get the CSS in. This gets you column, region, field, and link data from the "delivery-side content model" you get for free with STRI. The alternative are TBB and/or HTML-on-Staging approaches, but this is a quick-and-dirty way to get a screenshot since I don't always have access to the server. Increasing our Visitors/Day from 271 to 500? Ask more questions, and give more answers! How to handle link-only answers, which reference SDL Live Content?